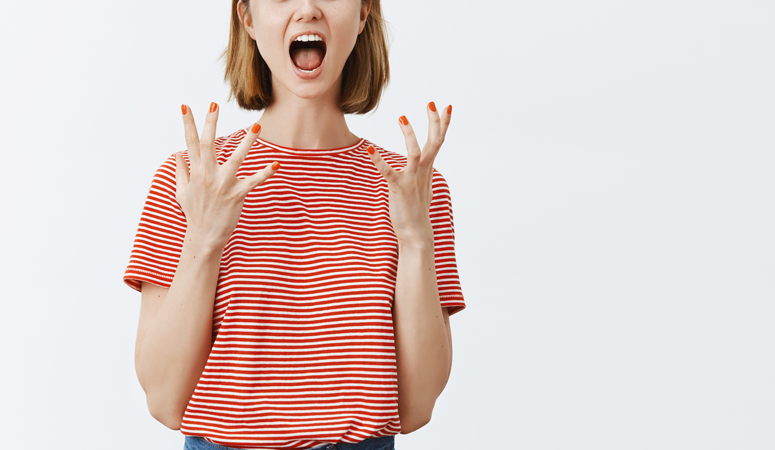 3 Secrets to Stop Losing Patience With Your Kids! Learn to Be Patient! 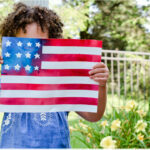 3 Secrets to Stop Losing Patience With Your Kids! I didn’t realize how impatient I was until I had children. My kids seemed to bring out all these hidden emotions instead of me! When our son was 6 weeks old he went through a growth spurt. He woke up what seemed like every hour of the night to eat. I knew this would happen. People told me it would. I experienced it with my daughter. But even with this knowledge I still found myself feeling frustrated. I NEEDED SLEEP! Why was my son not understanding this!? My attitude and thoughts quickly spiraled out of control. I was ready to yell at my baby. I was actually becoming angry. Then I felt guilty for being angry at my sweet baby boy. He doesn’t know any better. Losing Patience? Lost Your Temper? 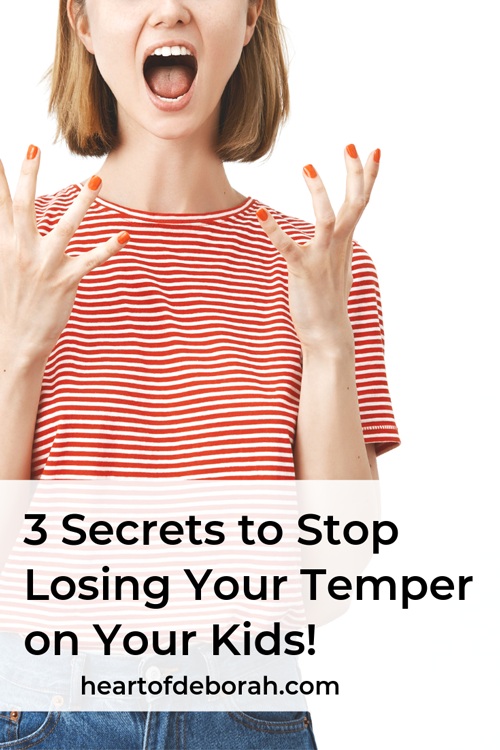 I want to share with you three ways I’ve learned to remain calm and not lose my temper. It’s taken some practice and sure there are times when I slip up. Especially, when my son, now 3, asks me over 50 times a day for a snack! But I’ve found a way to manage my frustration and not lose my cool as a mom. First, we must check our thoughts. As I sat with my crying baby in my arms I knew something needed to change. I was tired of feeling angry and as I sat there crying with him I realized, I need to take control of my thoughts. But how do I stop myself and actually do this in the heat of the moment? The first step to changing your thoughts is to recognize what you are thinking. 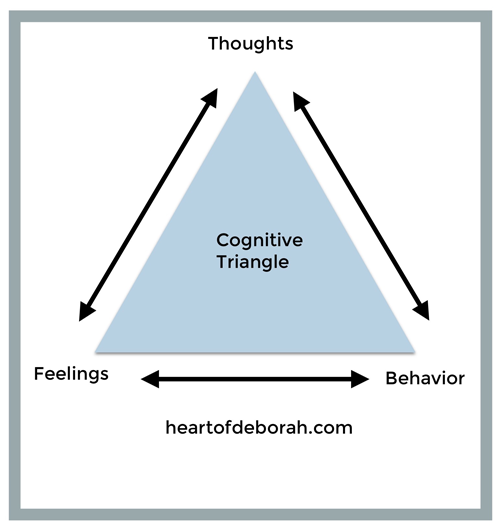 I also want to share with you the cognitive triangle. This is something I learned as a graduate student in psychology and it changed my thought life forever. Our thoughts, behavior and feelings are all connected. If we want to change how we are feeling (frustrated, overwhelmed) or change our behavior (yelling at kids) we can do this by changing our thoughts. It sounds simple, I know. But when we take a step back and analyze our thoughts, we may realize many of our thoughts aren’t helpful or rational. Let’s look at the example of a crying baby again. Had I made it through the day before without much sleep? Definitely! Was this the worst thing that could happen? Definitely not! Instead of focusing on the negative, I needed to start thinking helpful thoughts. Second finding perspective can change everything. Another strategy that has helped me time and time again is to find perspective. 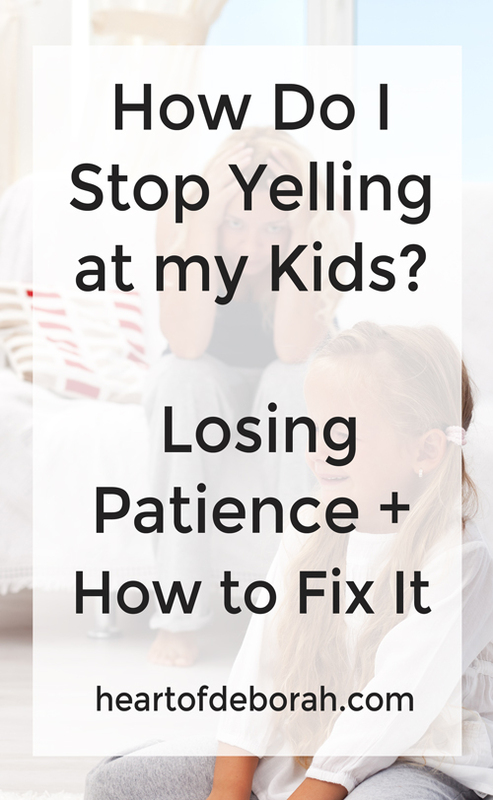 This is so important when I find myself losing my patience and ready to scream at my kids. I challenge my thoughts and tell myself this stage won’t last forever. I will sleep again. I am not alone in this. I also remember that kids will be kids. They don’t always know my expectations and it’s unrealistic to think they won’t ever push back or annoy me. I am also slowly learning to cherish these moments. Time moves so quickly and I don’t want to always focus on the next best thing while missing out on the present time. Lastly, we must identify our triggers. Another thing I’ve realized is I need to be more aware of my own emotions. I need to ask for a break when I need it, without feeling guilty! If sleep is a priority for me, then I need to start making it a priority. That means not staying up an extra hour to scroll through Instagram. Or asking my husband to get up first with the kids on Saturdays so I can have a few minutes alone in bed. Every now and then it’s good to take a self-analysis and see how you are doing. Don’t let your big feelings reach a boiling point. Take a few moments before you reach your breaking point to refresh and reset. Also learn your triggers. For me it’s feeling tired. When I’m not getting adequate sleep I much more likely to lose my temper. What are your triggers? Finally, it’s okay to ask for help or ask for a break. It doesn’t make you a bad mother. It makes you human. So what about you? 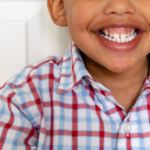 Do you lose your patience with your kids? How do you deal with your anger? Impatience? I’d love to hear from you in the comments below! Also be sure to connect with our community of moms on Facebook for more support and encouragement. Man I loose it more times than I care to admit with my three but this list sums up how I deal. My role as a mother is forever growing me. This is a post that I truly needed to read! 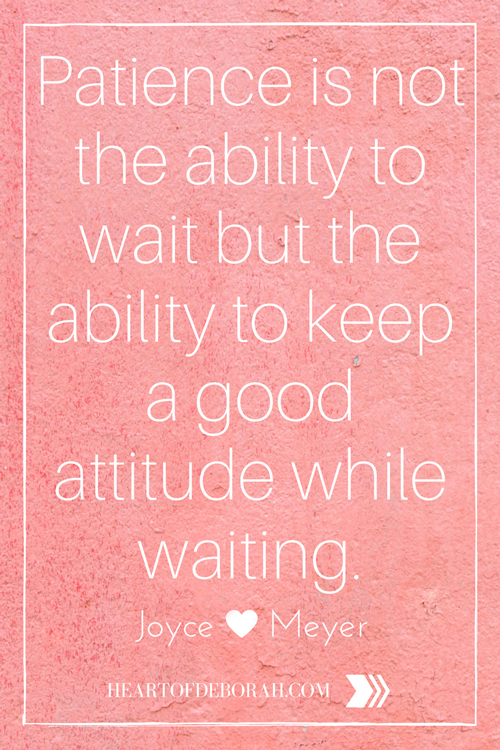 I get major mom guilt when I have lost my patience and I “lose it”. Being a parent is hard work and there’s really nothing that prepares you for the constant demands and mix that with all the other elements of your life and it’s more than one can handle. I find stepping out of the situation helps and I can re-group and re-approach. (I don’t leave my kids alone and drive away…. )but just stepping out of the room for a minute or two can really help. I will even say to my kids (I have 4) “Mommy, needs a minute to think” . But ya my patience is tried! Great tips! I have definitely been there. When I had my twins, I was there more often than not. 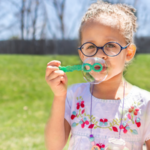 Learning when to walk away and give myself a “mommy timeout” helped a lot too. I realize that I loose my cool with my daughter when I haven’t had a break. I usually have kid free weekends but since festival season has started, my little lady and I hang out on weekends. So I have been able to get a break during the week and it really helps. Oh gosh, I lose my patience all the time! I totally thought I was a patient person before I had kids. I’m a work in progress. Hi Lauren! I have teenagers and I still lose my cool with them. We are human. As kids get older, they start talking back and want to argue. I find it helpful to take a deep breath and remember not to engage with them in an argument when they are being moody, etc. Good luck! I’ve been there recently with newborn woes. It was HARD. But I struggle more with losing patience with my toddler. It’s super hard to remind myself that it’s not that big of a deal. And recently I lost it so much that I had to apologize to my son because I told him mommy wasn’t being very nice. LOL. These are such important steps to take to keep control. 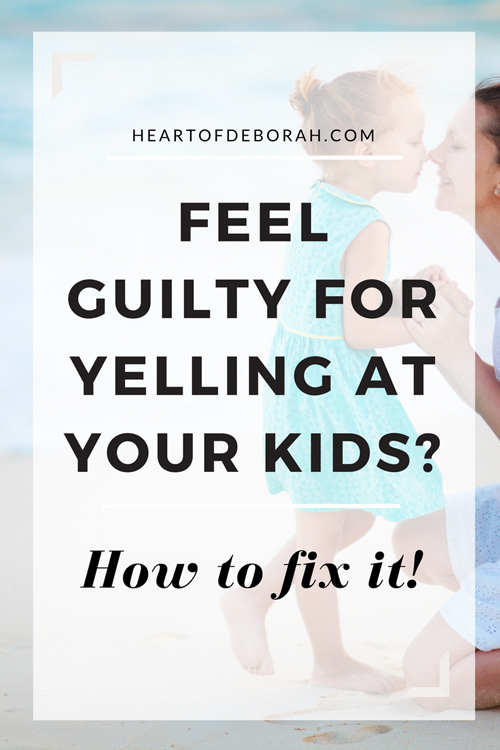 It can be so easy to get upset when you’re exhausted and your kids are pushing you to the breaking point. These are really helpful to redirect before it becomes anger. Wow, this post is really great. It sums up so many of my emotions and thoughts while nursing my 3 months baby girl. And then I feel so ashamed, as I am trying so hard to feeling impatient again. This post has really helped so so much! Thank you! I really needed to read this! I use to yell at my son all the time and stop when I received God! I was doing great but now I find myself going backwards and my husband isn’t helping at all! I’m always in the prayer closet because I refuse to go back to where I came from! I truly enjoyed reading this and related to it. We live in a large city and have time schedules. Lately though I’ve really been conscious and realized my 3 year old doesn’t know time and schedules and that’s actually a beautiful thing. So when he wants more time to play with me before heading to the next thing I take a deep breath and enjoy the moment. I’m on a schedule not him. It’s actually been very positive and allowed us to really enjoy the small moments in life. As mothers, wife’s, professionals, etc we’ll always have somewhere to be but being in the moment is the most important lesson we can teach our children.